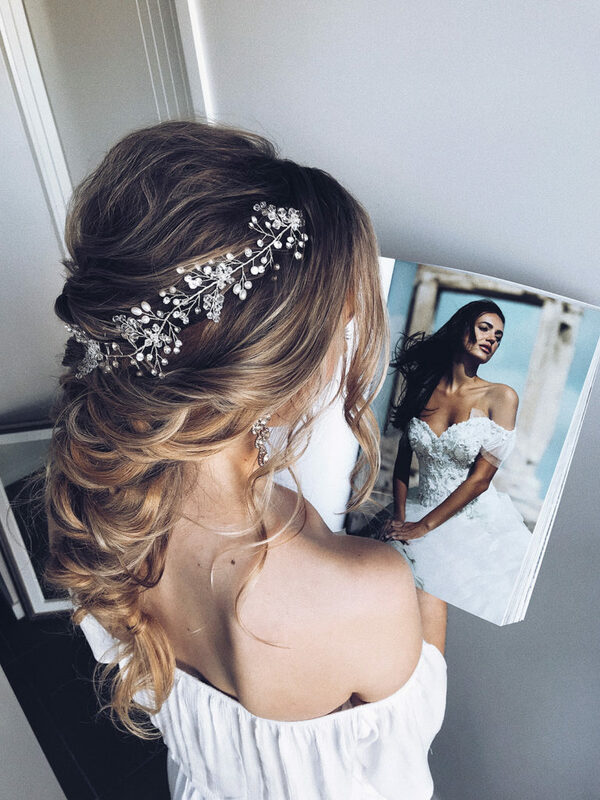 Most of my brides see me ahead of time for a hair trial but many brides trust my work, are just super lax and are happy to go with the flow or simply just don’t have it in their budget. 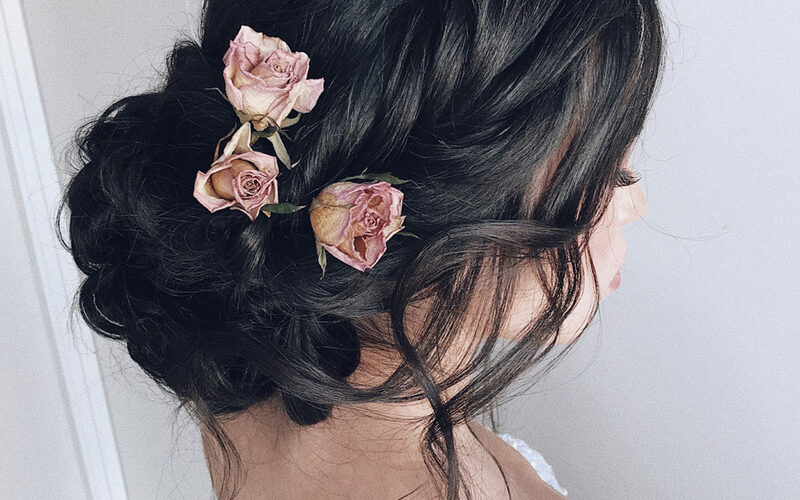 If you have had a hair trial with me then you’d be up to speed on when to wash your hair and what not to do with preparing your hair for styling. If you fall into the category of having no idea and have not had a trial, don’t worry – I’ve got all the prep advice right here for you. If there’s something I haven’t covered that is specific to you I’m only an email away! Wash and dry your hair the day before your wedding. Shampoo twice and do not condition your hair. If you really can’t stand the thought of not using conditioner, only apply a small amount of conditioner mid lengths to ends and rinse very well. The reason I don’t recommend conditioner or treatments is it can make the hair heavy which is not ideal if you’re wanting curls to last. After you’ve washed your hair make sure you blow dry it instead of letting it dry naturally. Don’t have wet or damp hair on the day as this is also not ideal if you’re wanting your hair style to last! Don’t apply any oils or styling products. Clean, dry hair is always best. If you had a trial with me and loved it, great! Otherwise, get an idea of what styles you like and have them ready to show me on the day (or send me a sneaky email ahead of time so i can have a reference point). Make sure you’re looking at photos that are close to your own hair colour as the same hair style will look very different on different coloured hair. Have any hair accessories ready that you will be having applied. This could be any combination of a veil, clips, combs or flowers. Bring your clip in human hair extensions if you want to have a fuller, voluminous or long hair look. 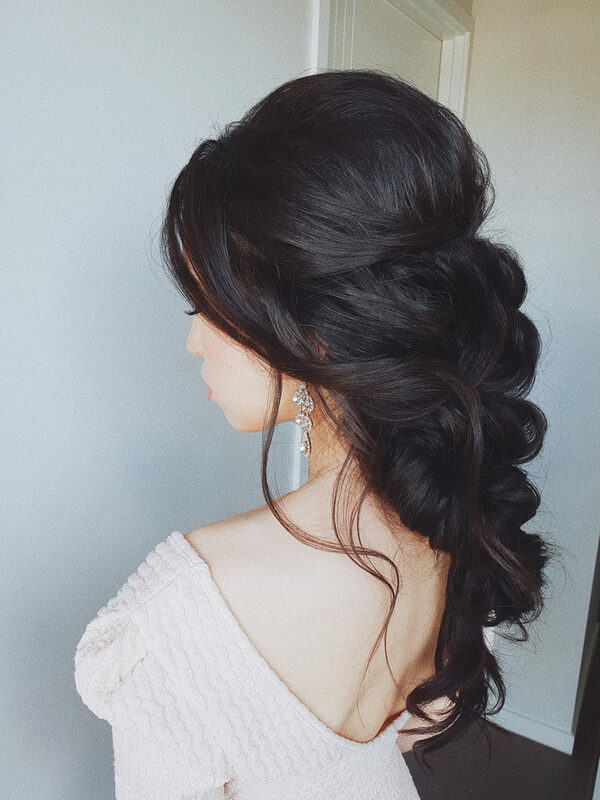 Hair extensions, (even if bought from new), should be washed and dried before the wedding day and can be done well ahead of time. This is to ensure the hair is free of any packing chemicals or product build up so to not hinder your style. Consider the space we will be working in. Usually a dining chair (no high stools), a table for my tools and access to a power point is best. Having your hair styled outside is best avoided so the elements don’t interfere with the hair before it’s been set and sprayed in place. If you have very oily hair or perspiration issues please let me know and I’ll be able to help you. If your oil or perspiration is moderate you can wash and dry the night before. If your issue is quite severe you may need to wash the morning of your wedding but please touch base with me first so we can discuss any pros and cons in relation to your style and hair type. If you have very short hair above the ears or are only having a blow dry, you may wash recently before your appointment and come with damp hair. Alternatively, come with clean dry hair and I can wet your hair down. If you have afro or very curly hair and are wanting a smooth hair style you may wash and dry the day before and can pre straighten your hair if you like. A rough blow dry is usually fine for this hair type.